Istanbul—On Tuesday, June 16, 2015, His All-Holiness Ecumenical Patriarch Bartholomew warmly received the Executive Committee of the Assembly of Canonical Orthodox Bishops of the United States of America at the Phanar in Constantinople. During the meeting, which took place in a spirit of open exchange in the personal office of the Ecumenical Patriarch, the hierarchs reviewed with His All-Holiness the work of the Assembly of Bishops, especially as it relates to the overall work of its committees. Particular attention was given to the work of the Committees for Pastoral Practice and Canonical Regional Planning. The hierarchs also discussed a number of challenges and opportunities in the formulation of a proposed plan for the restructuring of the Orthodox Church in the United States. Joining the Ecumenical Patriarch, Elder Metropolitan John of Pergamon discussed the mission of the Assemblies of Bishops as originally envisioned at their inception in Chambésy in 2009. Both the Ecumenical Patriarch and Metropolitan John commended the efforts of the U.S. hierarchs, and acknowledged their work as a model for inter-Orthodox cooperation. Present at the meeting with the Ecumenical Patriarch and Elder Metropolitan John of Pergamon were the following members of the Executive Committee: Archbishop Demetrios (Ecumenical Patriarchate, Assembly Chairman), Bishop John (Moscow Patriarchate, Second-Vice Chairman), Metropolitan Antony (Treasurer), Bishop Longin (Patriarchate of Serbia), Archbishop Nicolae (Patriarchate of Romania), Metropolitan Joseph (Patriarchate of Bulgaria), Bishop Saba (Patriarchate of Georgia). Also present were Bishop Maxim (Coordinator for Committees) and Metropolitan Tikhon (OCA). 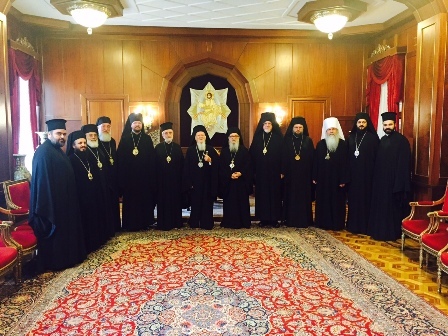 At the conclusion of the meeting the hierarchs departed with a renewed spirit of love and unity, eagerly looking forward to the annual General Assembly Meeting, which will take place in Chicago from September 14-17, 2015.